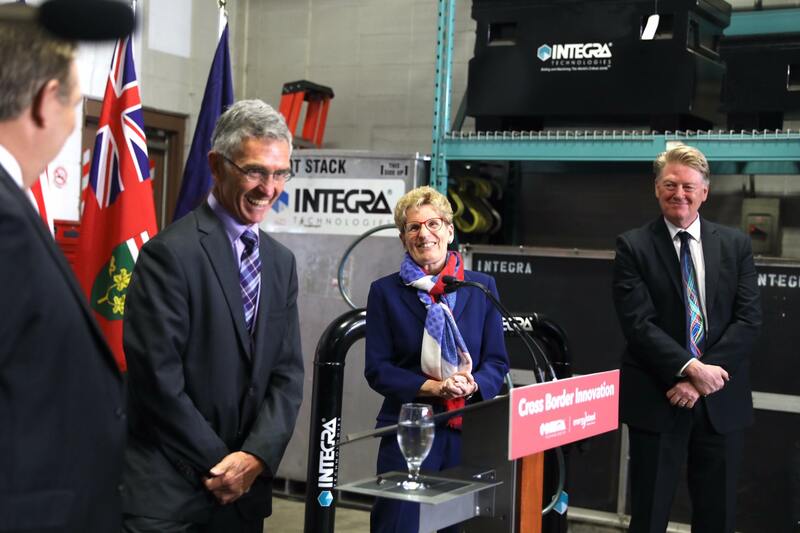 The Organization of Canadian Nuclear Industries (OCNI) congratulates INTEGRA Technologies and Energy Steel on establishing a cross-border strategic partnership to manufacture and sell the patented BlackHawk™ Hydraulic Nut. May 5, 2017, Pickering, Ontario. – The Organization of Canadian Nuclear Industries (OCNI) is proud to congratulate OCNI member companies INTEGRA Technologies of Sarnia and Energy Steel of Lapeer Michigan on establishing a cross-border strategic partnership to manufacture and sell the patented BlackHawk™ Hydraulic Nut that can significantly speed upmaintenance on critical equipment such as reactor vessels, heat exchangers, and high pressure flanges at nuclear plants in the USA, Canada and around the world. 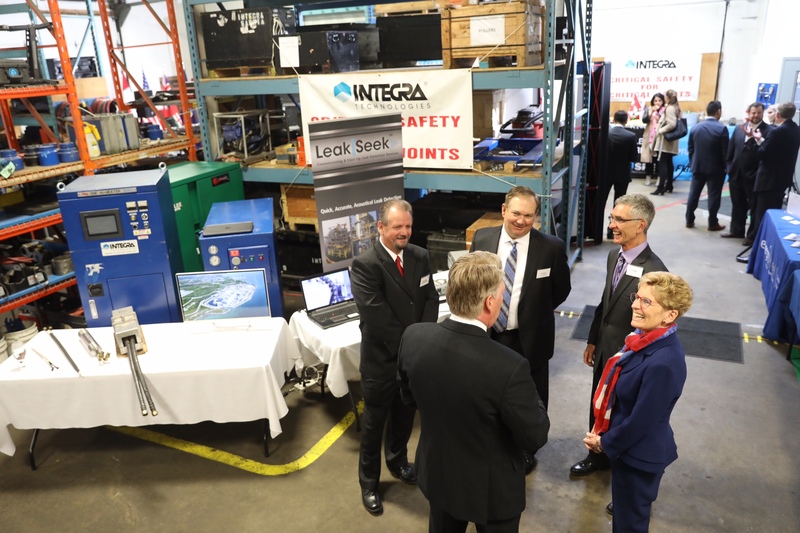 Ontario Premier Kathleen Wynne took part in a ceremony today at the INTEGRA Technologies facility in Sarnia to celebrate the INTEGRA-Energy Steel partnership that supports the safe, reliable, cost effective operation of Ontario’s nuclear fleet as well as nuclear plants in the USA and around the world. INTEGRA Technologies provides leak detection, correction, and prevention to the energy industry through a suite of specialized services including controlled bolting, field machining, and power generation services, along with equipment rentals and patented engineered products. From initial engineering and construction to ongoing maintenance, INTEGRA Technologies supports clients every step of the way with a focused expertise on critically bolted connections. With nine offices across North America, INTEGRA Technologies has ensured the highest level of Certainty of Outcome to its clients for over 30 years. Energy Steel provides legacy replacement parts & components and custom fabrication of mechanical components with over 30 years of experience. Energy Steel’s areas of expertise include OEM part obsolescence, pressure vessels, heat exchangers, pumps, fabricated structural supports, specialty machined components, and component refurbishment. Energy Steel is a subsidiary of Graham Corporation in Batavia, New York who maintains an ASME N certificate. Energy Steel’s facilities in Lapeer and Batavia maintain over 250,000 SQFT of shop floor space. Organization of Canadian Nuclear Industries (OCNI) is an association of more than 200 Canadian suppliers to the nuclear industry that employ more than 12,000 highly skilled and specialized engineers, technologists, and trades people. OCNI companies design reactors, manufacture major equipment and components, and provide engineering services and support to CANDU nuclear power plants in Canada as well as to CANDU and Light Water Reactor (LWR) plants in offshore markets. (905) 839 -0073 or (647) 407 6081, ron.oberth@ocni.ca.